View More In Safety Harnesses. 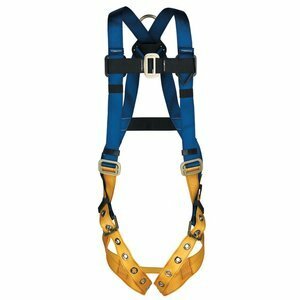 FEATURES: Back D ring, Tongue Buckle Legs Lightweight and Universal Fit Full Chest Strap and Sub Pelvic Adjustment for Safe Position in event of a fall Meets ANSI and OSHA RequirementsThe Werner BaseWear line provides solid performance in a Universal Fit Harness. The lightweight and 5 point adjustable design allows for ideal fit for a variety of sizes. Slotted pass thru buckles are at the chest and legs. BaseWear includes convenient web and lanyard keepers. An impact indicator and well protected labels aid with inspection. If you have any questions about this product by Werner Ladder, contact us by completing and submitting the form below. If you are looking for a specif part number, please include it with your message.